Here are some graphical faults with games I've encountered and have been able to verify on other boards, mostly because I bought a second board to replace the first. In all cases, it turned out that the fault was on both PCBs (and others elsewhere), so here they are for reference. This is an easy one to spot. On the Namco release, wait for the attract mode to show the dragon attacking the first end-of-level boss. As the dragon is being shot and dies, part of the sprite disappears, as shown here. This can also be seen sometimes during the game itself. The Atari release is interesting. I bought it thinking it wouldn't have the fault. What's interesting is that a new attract mode is available on the Atari release and on the "New" Namco version. Setting the Rank to A or B on the Atari version changes the attract mode to the one with the obvious fault. The New Namco version has a much shorter attract mode, and the Atari version's is much longer. The Old Namco version only has A and B Rank options available (according to the Atari manual, Rank C is the recommended setting). I've seen this fault on another PCB in an arcade in Tokyo. Like Dragon Spirit, Splatter House is a Namco System 1 game, and exhibits similar problems. One example can be seen quite early in the first level, when part of Rick "disappears". It was very difficult to get a good photo of this, you can only just about see the problem. Here's a nice video by superdeadite showing this problem exactly on his PCB (about 20 seconds in). 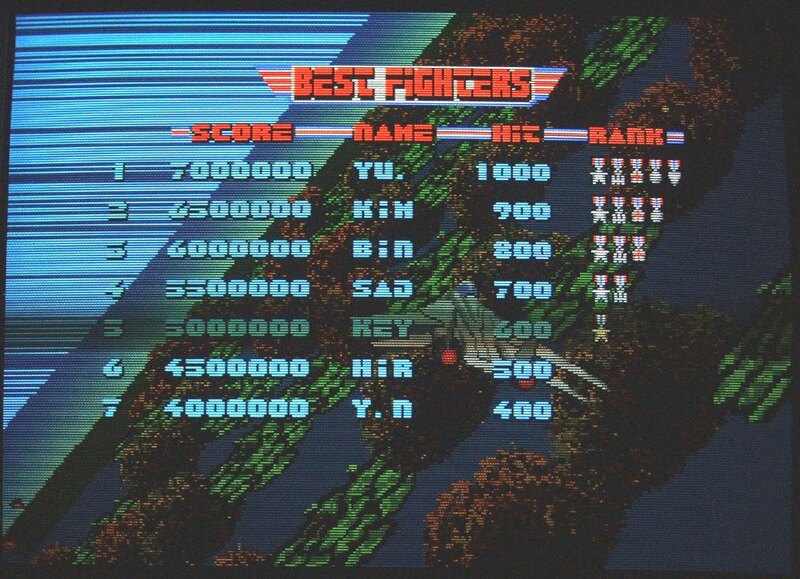 I've also seen this in an arcade in Tokyo. Other System 1 games may exhibit this behaviour. I think I've seen it briefly on Marchen Maze, but not on Pac-Mania. Here's a problem on the two Bubble Bobble PCBs I own. On levels where fire bubbles appear, bursting them and allowing the flames to spread results in some of the flames not being fully visible, or sometimes not visible at all. On the JAMMA+ forum some other Bubble Bobble owners confirmed the existance of this problem. Both of my PCBs are Taito versions. I burnt new ROMs to switch one to the Romstar version, this made no difference. Another game where I bought a replacement PCB for a fault I thought my first one had. When the rock monster at the end of the first level is attacked (most notably with bullets) some of the rock sprites show corruption. My second board was not fully original, it had decrypted ROMs but still shows the same problem. This is a well know fault. Thin lines appear on the left hand side of the screen as the action scrolls. This is an unusual one, and may be particular to my setup. 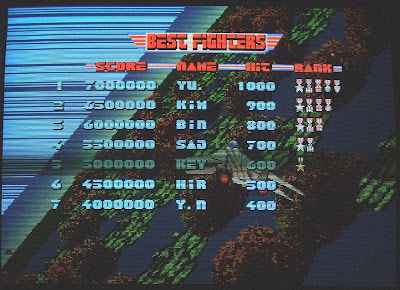 If the game's Cabinet Type dip switch is set to "Upright", I get graphical problems visible on the sky when the high scores appear. This goes away if the Cabinet Type is set to either of the "Moving" types. Furthermore, if I turn the PCB on and immediately play a game before the first attract mode starts, I don't get the problem. If I were to guess I would say that the problem is related to my JAMMA harness and perhaps is timing related. I had sent it away for repair and the board came back just as it had been, but with the dip switch changed, so I'm guessing the guy repairing it found nothing wrong. He forgot to send back the joystick and harness too, but that's another story altogether. An annoyance rather than a glitch with these two games is that they expect the monitor to be rotated through 180 degrees to every other horizontal PCB I have.